The few small cruise ships visiting Port Antonio tie up at the Ken Wright Pier in West harbor. The heart of Port Antonio is an interesting 15-minute walk east (be cautious of traffic). The wharf area is fenced and off-limits to vendors and unlicensed taxis. There is no bus service from the piers to town. Tourist information is available from the Tourism Product Development Company office at Errol Flynn Marina and the Jamaica Tourist Board office in City center Plaza on harbor Street. Open Monday-Friday 8:30 am-5:30 pm. 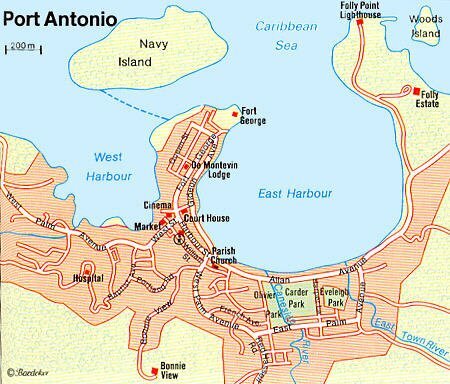 Port Antonio 68 miles east of Ocho Rios, has been the capital of Portland since 1723 when the parish was founded. Poet Ella Wheeler Wilcox (1855-1919) described the town as the 'most exquisite port on earth.' Back then it was Jamaica's main banana port. Melancholic Port Antonio's still has the rakish air and tropical lassitude of a maritime harbor, and there is little of the hustle of Montego Bay or Ocho Rios. Goats snoozing in the shade of verandas sum it all up. Don't be afraid to take Jamaican local buses. They are 10 times cheaper than tourist taxis. Don't let those (tourist) taxi drivers rip you off. Local taxis (called "route taxis") are an interesting way to get around and far cheaper than tourist taxis. Consider signing up for the excursions offered by your ship. They may not be the least expensive way to see the area, but you won't have to waste your limited time making arrangements yourself-and you won't have to worry about missing the ship (a serious consideration, given the state of the roads in this region). Shore excursions-and their prices-vary from cruise line to cruise line. Typical excursions include swimming and snorkeling, riding down the Rio Grande on a bamboo raft, exploring the fossilized sea life in Nonsuch Cave or visiting Athenry Gardens, a tropical paradise with spectacular views. Check with your ship's shore-excursion staff or your travel agent for additional information. Many Jamaican ATMs accept international bank cards. Most Jamaicans speak Jamaican Creole, also known locally as Patois. English is widely spoken. Mon-Fri 0800-1600, Sat 0800-1300. Some shops close half day Wednesday in Kingston, and Thursday in the rest of the island. New Year's Day - (1st January) or in case New Year falls on Sunday then the day after Year's Day. National Labour Day - 23rd of May provided that if the 23rd day of May falls on a Saturday or a Sunday, Labour Day shall be kept on the Monday following.